The purpose of this piece is to support the view that President Mnangagwa may follow the footsteps of Prime Minister Muzorewa if he continues to get advice from the likes of Christopher Mutsvangwa and other intellectually tired/power hungry ZANU PF war fighters. The article will also give a detailed comparison between Prime Minister Muzorewa and President Mnangagwa’s transitional governments and support the recent MDC Alliance diplomatic offensive to USA against the alleged coup government. In 1976, Muzorewa went into self imposed exile in Mozambique and it is alleged that a crowd of 100,000 people welcomed him upon his return to Zimbabwe in 1977. 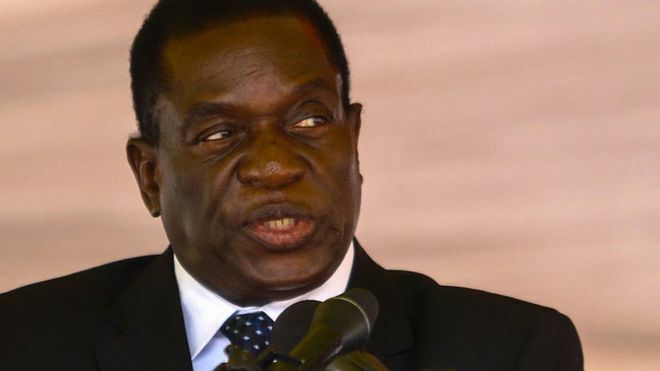 When Mnangagwa was terminated by former President Mugabe, it is also alleged that he escaped to South Africa and returned after a bloodless coup by the military of Zimbabwe. A bigger crowd welcomed President Mnangagwa upon his return and was later declared a president by the military hiding in ZANU PF colors. Unlike President Mnangagwa, Prime Minister Muzorewa preferred to take the country through diplomacy and not military. In April 1979 we are told, Muzorewa went for election without the backing of PF ZAPU and ZANU and won 51 of the 72 black parliamentary seats and was later declared a Prime Minister. At least Prime Minister Muzorewa was a people’s president compared to President Mnangagwa whose power is said to be emanating from the barracks. The challenges that faced Prime Minister Muzorewa are likely to be the same challenges that are likely to face President Mnagagwa’s transitional government. Prime Minister Muzorewa government failed to get legitimacy from the citizens of Zimbabwe because he couldn’t work with ZANU and PF ZAPU. President Mnangagwa is heading for the same Prime Minister Muzorewa’s problems because he refused to work with MDCs and the civic groups. The MDCs were going to help President Mnangagwa in economic growth and the cabinet of President Mnangagwa consists of deadwoods, who are experts in greedy, jealous, corruption and not even trusted in Iraqi or Somalia. That cabinet cannot even manage a tuck-shop and the rating of President Mnangagwa is on free fall because his experiment of trying to recycle too old people who should be in Old People’s Homes. The other challenge that faced Muzorewa were the sanctions that had been imposed on Southern Rhodesia, the international community and the UN were reluctant to remove them before credible elections. Muzorewa government suffered a setback by the diplomatic offensive from ZANU and PF ZAPU forces campaigning for sanctions to remain and President Mnangagwa was among the group calling for the sanctions to remain. Today, MDC Alliance has become a serious threat to President Mnangagwa’s government, they want the ‘Smart Sanctions’ to remain, they want the international community to release money to a legitimate government, not a government anointed by the military and they feel that President Mnangagwa is a president of the army and not the people. Because of the MDC Alliance’s diplomatic offensive drive against President Mnangagwa’s government, I doubt whether ED will be supported by international community with handouts to resuscitate the economy of Zimbabwe in the near future. Just like ZANU and PF ZAPU’s diplomatic offensive against Muzorewa, President Mnangagwa is likely to be soiled by MDC alliance’s diplomatic offensive, USA and Britain are still reluctant to support President Mnangagwa. Mr. Biti told the USA congress that President Mnangagwa is another Mugabe but with a different name, a position not good for the progress of ED’s government. There is mixed reaction from the media on the MDC alliance’s diplomatic move, but I support their diplomatic move by 124.9% because ZANU PF and PF ZAPU once did that to Prime Minister Muzorewa’s government and MDC alliance has not broken the constitution of the land. I am afraid that if the international community gives ZANU PF government money, the money is still in hands of thieves, it is like requesting a hungry lion to take care of the ‘baby’ of a goat. Money should be given to Zimbabwe when the government is accountable to the people. In April 1980 election, Muzorewa lost dismally to the then Prime Minister Robert Mugabe who got 57 parliamentary seats out of 80 black seats. Muzorewa only managed 3 seats. Now, my prayer is that, history should repeat itself, President Mnangagwa is most likely to fall to MDC alliance if the elections are to be free and fair in 2018. I can breathe the end of ZANU PF party, President Mnangagwa should prepare for his dignified exit by implementing electoral reforms. ZANU PF should restore the dignity of the late Prime Minster Muzorewa by accepting and legitimizing 1979 leadership. They should accept Prime Minister Muzorewa as government as legitimate and or bulldoze the bones of the late Prime Minister Muzorewa to the national shrine, doing so will be also a way of legitimizing President Mnangagwa’s transitional government before Zimbabweans. Don Chigumba is a political analyst based in South Africa.